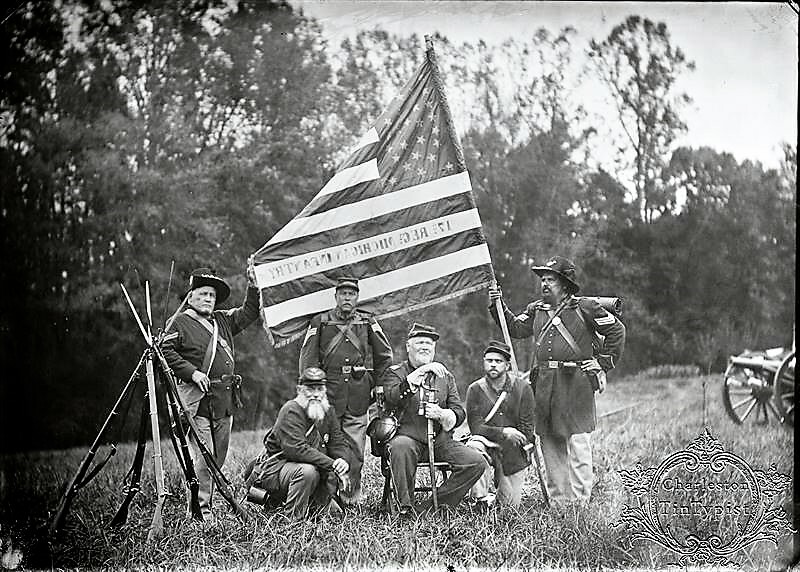 Honoring the men of the 17th Michigan Volunteer Infantry Regiment, members pose with their new regimental flag. Beginning in 2018, the 28th NC Troops designated the 17th Michigan Volunteer Infantry Regiment as their standard Federal impression. The Regiment was assigned to the First Brigade, First Division of the Ninth Corps.The Regiment was distinguished with eight Medal of Honor recipients. During the war 1,224 men served in the 17th Michigan Volunteer Infantry with 270 never reaching home and 249 being discharged for disability. On March 22nd of 1864 the 17th Michigan received orders with the rest of the Ninth Corps to rejoin the Army of the Potomac. It didn’t take long before the Regiment was pitched into battle again at the Wilderness on May 6th. Just a few days later on the 12th the men fought again at Spotsylvania Courthouse where a large part of the Regiment was surrounded and captured by Lanes Brigade They went into that fight with 250 men and left with about 50 in the ranks. While about 100 of the men suffered in Andersonville what was left of the Regiment continued to see action at Cold Harbor, Petersburg and Appomattox.